MILWAUKEE (AP) — The Milwaukee Bucks‘ key free agent acquisition is a big man who could have an impact from the perimeter. Brook Lopez started at center in the Bucks’ preseason opener against the Chicago Bulls, the first basketball game at Milwaukee’s new Fiserv Forum. Lopez scored six points on 3-of-8 of shooting, missing all three 3-point attempts, in 15 minutes as the Bucks rolled to a 116-82 victory on Wednesday night at their new home arena. It was a milestone moment for a team featuring All-Star forward Giannis Antetokounmpo that hopes to secure a top-four seed in the Eastern Conference playoffs this year. “I think the stars have really aligned. We have all the talent in the world on the floor,” Lopez said. The 10th overall pick by the Nets in 2008, Lopez averaged 13.0 points per game last season, matching his career low, in 74 games with the Los Angeles Lakers, after spending his first nine season with the New Jersey-Brooklyn franchise. But Lopez averaged more than 20 points a game in each of the two previous seasons as his game transitioned from underneath the basket to the perimeter. Lopez didn’t hit his first career 3-pointer until 2014-15, when he was 1 of 10. Two seasons later with the Nets, he was 134 of 387 (34.6 percent) from behind the arc. 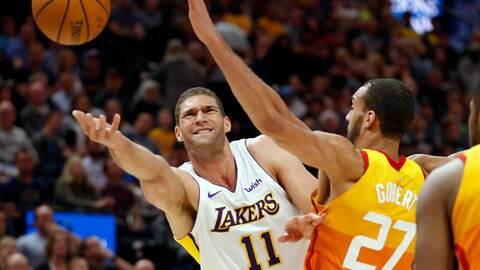 With the Lakers, Lopez was 112 of 325 from 3-point range. His rebounding numbers have dropped as his offensive game moves further away from the basket, from 7.8 per game in 2015-16 to 5.4 the following season and 4.0 last season. “The benefit you get from the 3-point shooting and the space, I think outweighs whatever you’re losing on the offensive boards,” said coach Mike Budenholzer, beginning his first season with the Bucks after five seasons as coach of the Atlanta Hawks. Budenholzer is encouraged by Lopez’s physical presence, as well as how the 7-footer fits with Antetokounmpo’s game. Lopez will join a center rotation that includes 6-11 John Henson, 7-footer Tyler Zeller, and 7-1 Thon Maker, who started in the playoffs after limited playing time late in the season.